I am quite sure the vast majority of visitors to Venice, get so intoxicated with the kaleidoscope of images before them and the exhaustive walking from one grand palace to another baroque church that thoughts of travelling elsewhere in the Venetian Lagoon are maybe far from their thoughts. However, the waters of the lagoon offer many relaxing diversions away from the bustle of Venice and the photographic opportunities are considerable. The lagoon itself is home to more than 30 islands within its 200 square miles and more than a dozen are still inhabited. My particular favourite is the colourful island of Burano. Although Burano is one of the furthest Islands from Venice it is easily reached by Vaporetto direct from Venice or the Lido and takes approximately one hour. The approach to Burano passes low marshland with interesting bird life and occasionally glimpses of the fishermen who climb from their boats on to the sand flats in search of clams and crabs. Soon the leaning bell tower of Burano’s San Martino comes into view and as the Vaporetto glides nearer, the colourful houses of Burano can be glimpsed nestling together. For me, Burano is the most picturesque island in the lagoon. With its brightly painted houses and fishing boats moored outside on the canal streets, it becomes a photographer’s paradise. The colourful houses are said to have originated from the fishermen’s wives whose idea was to use the colour of the house as a guide for their menfolk returning home after a day’s fishing. Although primarily a fishing community, Burano was one of the first settlements in the lagoon. A strong lace making tradition emerged on the island with the Scuola del Merlatti (lace making school) being founded in 1872. Regrettably the school closed in 1991 and today is a Museum, however it now serves as a meeting place for the lace making ladies of Burano to practice their craft. 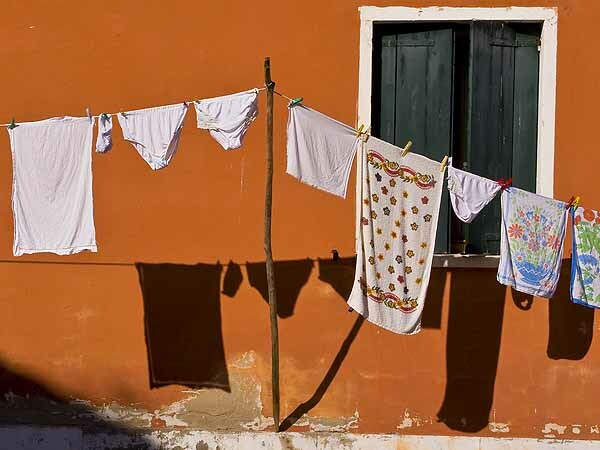 The famous Burano lace can still be purchased on the Island but to satisfy the international tourist trade much is now imported, so it pays to check before buying. The island has a number of small squares and the narrow canals are connected by attractive bridges, there are even trees to provide some green and shady contrasts. However, the main street of the island is Via Baldassare Galuppi which contains a number of traditional trattorias . This street was named after Baldassare Galuppi (1706 – 1785) a composer of operatic and sacred music who was born in Burano. You certainly won’t need a map to get you around, just wander along the canal sides and fix your bearings on the famous leaning campanile tower of San Martino. That perhaps is the joy of Burano, it is so easy to explore and compared to Venice it never seems over crowded. This helps enormously with photography as you never seem to be waiting too long for visiting tourists to escape from your viewfinder. Photographically Burano remains quite addictive with the brightly painted houses, doorways and windows crying out for a careful composition. Canal reflections and of course the ever present peeling walls all add to the images readily at hand. 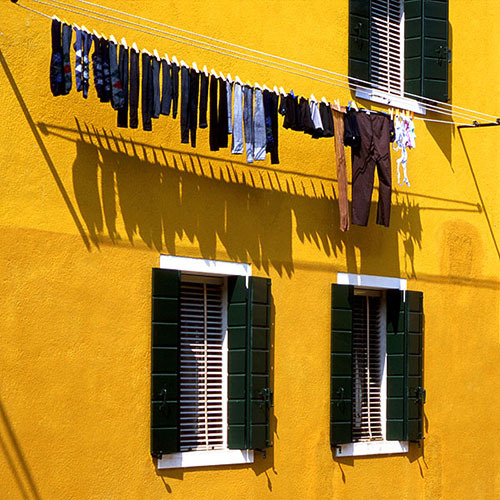 However on the day of my visit I was particularly struck by the washing lines of Burano. 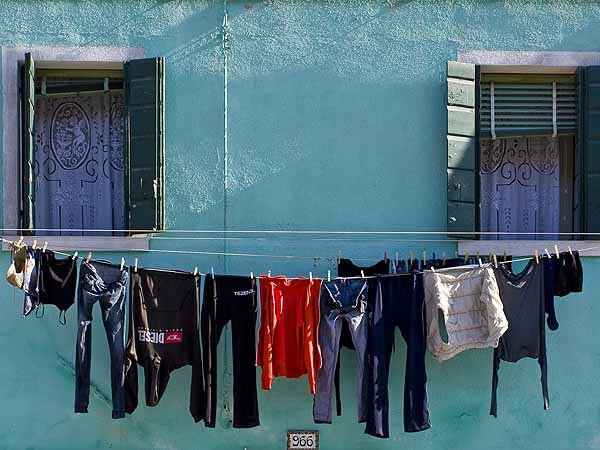 I cannot believe it was the islands “wash day” but seemingly at every turn and in every street and piazza, washing was neatly hanging out to dry. 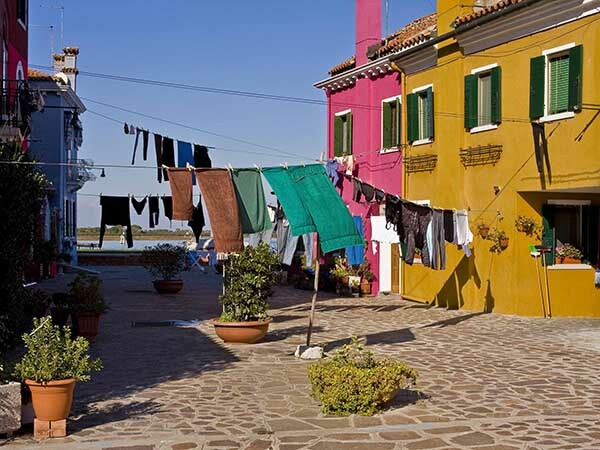 It appears that the ladies of Burano are so proud of the appearance of their homes and their island that hanging washing out to dry has become something of an art form in itself. Several lines were either colour co-ordinated and almost all were hung in sizes from smallest item at one end to largest at the other. During my visit I endeavoured to provide an image of the island as a living community, and ignored the shops and restaurants, preferring instead to capture the individual houses, canals, the odd bicycle propped outside a home, ladies enjoying a chat, tightly cropped doorways and windows and of course those ever present washing lines.